We are aware of the turbo brushes that come along with many vacuums but the dedicated motor for the brush in this machine makes it stand out. 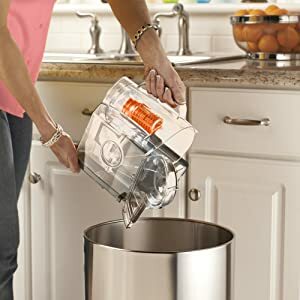 In the Electrolux UltraActive DeepClean Bagless Canister Vacuum review, we will outline the feature of the vacuum along with its advantages and shortcomings. It is perfect for bare floors and all types of carpets. It is one of those vacuums that offers outstanding cleaning on bare floors as well as carpets – low and high pile. The ability of this Electrolux model to perform so well comes from the brush which has an inbuilt motor that works for the brush. This makes it extremely powerful when it comes to deep cleaning carpets. The EL4300B is one of the bag-less models of Electrolux. It is a compact canister vacuum which features cyclonic technology. It uses the HEPA filtration system making sure your house is free of allergens. The vacuum weighs 12.5 pounds only which makes it relatively lighter than many other vacuums of the same kind. The 13-inch power brush and the 14-inch natural bristle brush are great for deep cleaning all kinds of surfaces. The power brush has three carpet levels that you can choose according to your carpets so that they can be cleaned properly. The low-profile nozzle will easily fit under most of your furniture so you can clean under your furniture easily. It comes with an ergo-shock cord wrap which also acts as a bumper which protects furniture from scratches. It uses a hose-wrap system which makes it very convenient to store. The hose is 6-feet long and it allows you an adequate cleaning radius. 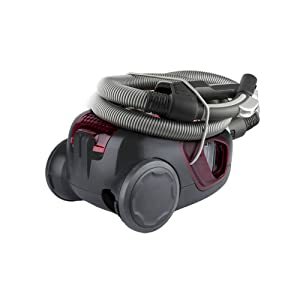 The vacuum features a dust container which can be easily emptied. If you do not like to replace bags every now and then, you will find this model to be a great choice for your home. The brush roll controls are on the handle so it is easy for the user to switch controls. Controls for the suction are located on the canister so you may end up bending over if you want to change the suction. However this may not be very inconvenient because we usually do not need to change the suction very frequently. The automatic cord rewind option makes it easy to deal with the 21 feet power cord when the vacuum is not in use. 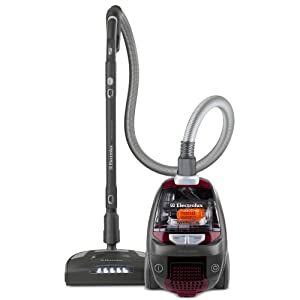 The EL4300B also features extendable wands and the vac has quick release buttons for changing the tools easily. The hose-wrap feature along with the compact design of the vacuum makes it very easy to store because it does not take a lot of space. Bare Floors: Electrolux provides the hard floor tool for cleaning bare floors. We have noticed that the performance of this tool is not as satisfactory and the motorized brush can be used for bare floors as well. For those who are concerned about scratching the hardwood, you may want to turn the motor of the brush off. Carpets: The motorized brush provides superior cleaning when compared to other vacuums. The fact that the brush is powered by its own motor, it has a better pickup power. When this is combined with the strong suction, you get a powerful cleaning device. Upholstery: The EL4300B comes with a mini turbo brush which ensures that your upholstery stays dirt-free. It is also handy for users who find the main attachment to be big for cleaning their stairs. You have two other attachments – crevice tool and dusting brush. Both of these are great for picking up loose dirt from most types of upholstery. Pet hair removal: The motorized floor head as well as the mini turbo brush are very good in picking up pet dander. So You don't have to worry about your upholstery and carpets being covered in pet hair. Make sure these brushes are cleaned regularly so that they can continue to perform efficiently. The EL4300B is a powerful tool and the motorized brush is its best feature. It is very effective in picking up dust and pet dander. HEPA filtration makes it great for those who suffer from allergens. The cyclonic technology makes it very efficient and avoid the issue of replacing the bags continuously. The power cord is adequate and the tool also has a telescopic wand which makes it easy to clean places above the floor as well. The 6-foot hose provides enough cleaning radius and the accessories make deep cleaning very easy. This review is aimed at helping you take an informed decision for buying a vacuum.